My Uncle Dave has often said that his strategy when hosting a dinner party is to first starve his guests, so that when dinner is finally served they will be grateful and hopefully happy to overlook any cooking mishaps. This, so he says, is why he never serves heavy appetizers and why he is always late getting dinner on the table. Of course, those of us who have been lucky enough to eat at Uncle Dave’s table know that this is a joke because his food is always delicious, but I do believe that there is something to the idea of not overdoing the appetizers. To this end, cocktail nuts have long been my pre-dinner nibble of choice. 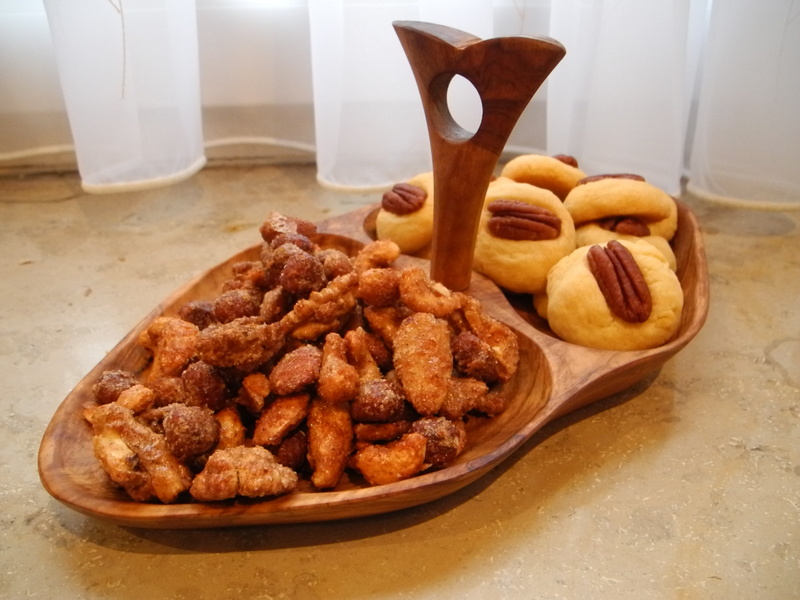 An aperitif and a small bowl of nuts have kicked off many a dinner party in my apartment. To date, I have not had any complaints, but I’ve also never before received the rave reviews elicited by Dorie’s Sweet & Spicy Cocktail Nuts, a previously completed French Fridays with Dorie recipe. I’ve actually made these nuts twice now. The first time I was not a fan of the recipe and swore never to make them again. Don’t misunderstand, the nuts were delicious, but I’m rather infamous for my lack of patience and wiping egg white off each and every nut by hand put me over the edge. But then I went and did something which I should have done to begin with, I read through the posts written by my fellow FFwD home cooks and noted their tips for how to make this recipe a little easier. The oh so simple suggestion to double the amount of nuts but leave the rest of the ingredients as written in the recipe proved to be the key. This meant that there was enough egg white and spices to coat the nuts without leaving a lot of excess to be scraped off and made the whole process quick and easy. With this little trick in my back pocket I will be happy to make these addictive nuts again and again. And again! Oooh! I have been meaning to make these for awhile now! I was going to make them for Mei’s birthday but ran out of time (and patience)…! 🙂 I’m glad for that little tip when I make these sometime soon too! I know I made these, but I don’t remember wiping egg white off the nuts or doubling it. Maybe I just went with it goopy?? I have no idea. 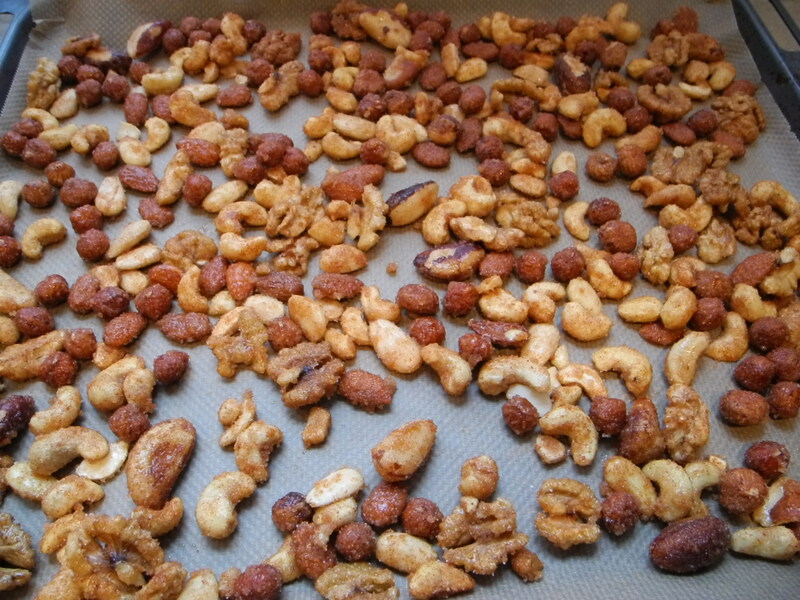 I’m hopelessly addicted to David Lebovitz’s nut mix. No other mix will ever live up to his for me. Your uncle Dave sounds like a character 🙂 I remember giving these nuts out as hostess gifts for the holidays last year..yummy! Your Uncle Dave does sound fun! Glad you were able to try these cocktail nuts! I’ve just been browsing your blog. I found you from the French Fridays site. Great reports on your cooking adventures, and thanks for commenting on the differences you find in Germany and the rest of Europe. Who knew about vanilla extract?